The Baltimore Orioles have had an amazing season. They weren’t supposed to be any good, but they kept winning. They were supposed to regress to the mean, but they never did. They spent the entire summer giving Pythagoras the bird, and then, forced to play for their lives on the road against a Rangers team that simply looked to have every advantage, they won handily. Behind Joe Saunders. Against a line-up full of right-handers. The 2012 Orioles are why there’s a Twitter account called “You Can’t Predict Baseball”. But, now, in a five game series against the Yankees, everyone’s going to bet against the Orioles again. Everything points to New York being the better team. They won more games. They scored 92 more runs and allowed 37 less. They have the best offense in baseball. They’re the Yankees. They have players who we expect to be good. The Orioles, meanwhile, have a roster full of guys with track records of mediocre performance. This isn’t a team full of fresh-faced kids straight up from the minors — well, besides Manny Machado, anyway — who are introducing themselves to the Major Leagues. It’s a roster heavy on guys who were discarded by other organizations, with histories that suggest that they just aren’t that good. Perhaps no player typifies the 2012 Orioles more than Tommy Hunter. And it’s guys like Tommy Hunter who are why we need to reevaluate what we know about the 2012 Orioles. Yes, Tommy Hunter. The 26-year-old right-hander who posted a 5.45 ERA this year, and was worth -0.4 wins according to FIP-based WAR. The guy with 470 innings as a big league pitcher, an ERA- of 109, and a FIP- of 115. Hunter was a throw-in in the Chris Davis–Koji Uehara swap, and has spent a couple of years as a no-stuff, pitch-to-contact #5 starter. And then, a month ago, the Orioles moved him to the bullpen, and started using him in shorter stints. And this is what happened. In the final two weeks of the season, Hunter’s fastball averaged 96.5 mph, the ninth highest average velocity of any reliever in baseball. 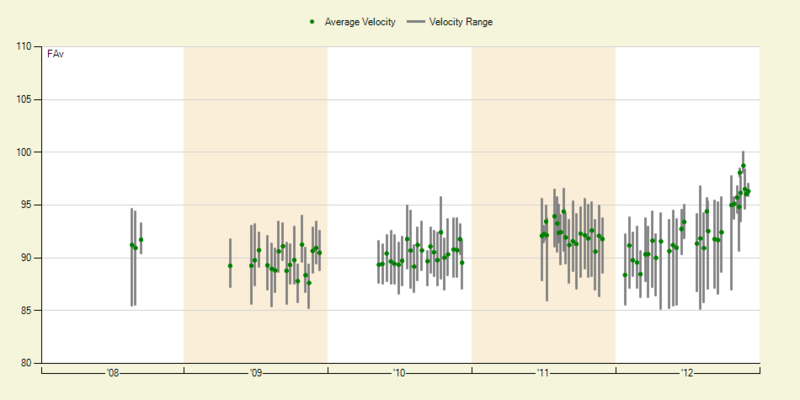 His fastball was essentially the equal (in speed) of Jason Motte, and was just a tick behind Craig Kimbrel. And, as a result, Hunter has transformed from a cutter-heavy contact pitcher to a four-seam fastball guy who misses bats. Opposing batters hit just .245/.280/.298 against Hunter, mostly because he struck out 23.5% of the batters he faced, double his career line as a starter. Put simply, Tommy Hunter the reliever doesn’t look anything like Tommy Hunter the starter. He might share the same name and body type, but we really need to put away any preconceived ideas we had about what kind of pitcher he is capable of being. As a reliever, he’s something very different. The same applies to Hunter’s teammates. We’re used to the Orioles being a bad baseball team. We’re used to Chris Davis, Mark Reynolds, Nate McLouth and Jason Hammel being mediocre players on bad teams. We’re used to the Yankees steamrolling Baltimore. However, We shouldn’t evaluate this series based on what we’re used to. This Orioles team does two things very well – they hit home runs and they don’t allow runs late in games. With 214 home runs on the season, the O’s hit more home runs than any team in baseball besides the Yankees. Their bullpen’s ERA- of 72 was the best in the American League, and third best in baseball. And both strengths are getting even stronger. And, with only four starters needed for the series, their already deep bullpen has just got even deeper. By carrying 12 pitchers, Buck Showalter has given himself eight relievers to mix and match with, including converted starters Hunter and Brian Matusz, as well as whichever of Chris Tillman or Joe Saunders doesn’t end up starting game four. Eight arms, three of whom can easily be stretched out for multiple innings, gives Showalter the ability to lean heavily on his relief corps, which is the group most responsible for the Orioles success this year. Last year, both Texas and St. Louis were carried to the World Series by strong, deep bullpens and the ability to hit the ball over the wall from time to time. This Orioles team has those same traits. And those traits shouldn’t be underestimated. Of course, there is no magic formula for October that guarantees success. The Yankees are a better team than the Orioles, and should probably be the favorites in this series. But they should probably be favorites along the lines of 54/46 or 53/47, rather than 60/40 or 65/35, like their respective reputations might lead you to believe. They don’t have a big advantage in this series. This match-up is basically a coin flip, because it’s beyond time to recognize that the Orioles are a good baseball team. It’s weird that Tommy Hunter now throws 95-100 and is blowing fastballs by hitters. It’s weird that the Orioles are capable of playing competitive baseball in October. But baseball is weird, and that’s why we love it. Don’t just look at the names on the back of the jerseys and assume New York is going to roll. The Orioles can win this series, and they can win this series because they have a bunch of guys who are better now than they used to be. We hoped you liked reading Tommy Hunter, or Generics versus the Brand Name by Dave Cameron! The Yankees and Orioles: Who’s the Underdog? I’m glad the “Orioles are just lucky” meme is starting to die. They erased their sizable run differential in about two months. As a Yankees fan I’m looking forward to seeing these two teams match up because they had already played some really entertaining games against each other in September.